Something about natural perfumes is so appealing. I envision a greenhouse with a long table heaped with blossoms. On another table, glass panes crush grease-laden tuberose flowers. A perfumer — always a woman with flowing hair and the witch-like quality of knowing the perfect herb for every ailment — dispenses jewel-toned liquids drop by drop into lead glass bottles. If love potions exist, surely they are made by natural perfumers. Of course, that’s just my overly active imagination. 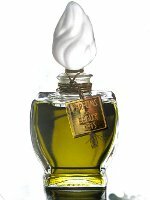 I know little about natural fragrances, and I haven’t developed much of a nose for them. My brief experience has shown natural perfumes to feel more “telescoped” and dense. I haven’t encountered one that’s a sillage monster — I doubt you’d get kicked off an elevator if you wore most natural fragrances — and they don’t tend to last as long as a department store fragrance. So I was curious to take Aftelier Secret Garden, an all-natural fragrance, and Dawn Spencer Hurwitz Pandora, a 97.5% natural fragrance, for a test drive. Would they smell too, well, wimpy? Short answer: no. Secret Garden has top notes of bergamot, bois de rose, Geraniol, and blood orange; a heart of jasmine sambac, raspberry (compounded isolate), Turkish rose, and blue lotus; and a base of civet, castoreum, vanilla, deer tongue, benzoin, and aged patchouli. (Deer tongue is a plant, by the way.) A series of letters between Mandy Aftel and Dawn Spencer Hurwitz on Nathan Branch’s blog outlines Secret Garden’s development. Secret Garden is a lush, jammy floral buzzing with jasmine and finished with sweet, fusty animalic notes. Secret Garden’s blood orange and raspberry are apparent right away, but lots of rich, spicy flowers keep it far from turning into a cocktail. I know calling something “seamlessly blended” is a cliché, but the fragrance truly is whipped into one silky fabric. Secret Garden feels like it could have been lifted from another time. It is feminine and emotional, but playful enough to earn a spot on Costanze Mozart’s dressing table. As the fragrance develops, Secret Garden smells more leathery-sweet and just a tiny bit dirty, but it keeps the integrity of its spicy-fruity heart. There’s something intensely romantic, but not at all saccharine, about this perfume. Hey, maybe this is the love potion I imagined. I tested both the Secret Garden Parfum and Eau de Parfum. I prefer the Eau de Parfum for its effervescence, but like the Parfum for the depth of its animalic notes. They both last about three or four hours on my skin. Dawn Spencer Hurwitz Pandora (97.5% natural) has a similar throwback feel as Secret Garden, but it moves you out of the flower-packed, boiserie-lined drawing room, through the room’s windows open to the summer garden, and to the leather and meadow of the stable. Pandora has top notes of aldehydes, bergamot, cassis bud, davana, green peppercorn, ozone, pink peppercorn, ruby fruits (botanical accord), spice notes, and violet leaf absolute; a heart of cabreuva wood, centifolia rose absolute, green tea absolute, juhi jasmine absolute, linden blossom absolute, orris root, and yerba maté absolute; and a base of ambergris tincture, Australian sandalwood, cyperus, fossilized amber resin, green oakmoss, mousse de Saxe no. 1 (botanical accord), muhuhu, patchouli co2, tonka bean absolute, vanilla absolute, and vetiver co2. On first smelling Pandora, I thought, “An herbal green chypre! Like Parfumerie Générale Corps et Ames.” (Side by side, Corps et Ames is more austere than Pandora.) Within a few minutes, when the minty, herbal top notes faded, a dry, spicy leather chypre emerged. “Aha! Just like Robert Piguet Bandit.” (Bandit is soapier and more angular.) Over the next hour, the fragrance continued to evolve, and its leather dropped evolved into the tonka-inflected, mossy dry down of a grand old oriental. Sadly, like the legendary Pandora’s box, once this box is opened, its delicious contents disappear too soon. The Parfum lasts three hours, tops, on my skin. I’d love to burn a Pandora-scented candle and infuse my house with its fragrance over an evening. Aftelier Secret Garden is available as 2 ml of Parfum ($45), quarter ounce of Parfum ($150), and 30 ml Eau de Parfum ($150). For information on where to buy Secret Garden, see Aftelier under Perfume Houses. Dawn Spencer Hurwitz Pandora is available as 15 ml of Parfum in “antique presentation” bottle ($225), a dram of Eau de Parfum ($25), or 10 ml of Eau de Parfum ($60). For information on where to buy Pandora, see Dawn Spencer Hurwitz under Perfume Houses. That Pandora – I’ve never been so tempted to spend $225 just to get a bottle, and the color of the perfume is equally compelling. (Can I buy a factice?) You make both scents sound delicious and definitely up my alley; it’s just a shame they’re so expensive, though their price may be more justified (because of the natural ingredients) than most of the “prestige” lines out there. They’re both lovely fragrances, but you’re right, they don’t come cheap. It must be like couture, where you pay for materials, small production, and artisanal labor. Man, I love that DSH bottle. So much nicer than the silly “Swarovski crystals” glued to ordinary mainstream bottles that are selling for 3x that price. It is a pretty bottle. I try so hard not to get attached to bottles, since I don’t plan on keeping them once they’re emptied, but a pretty bottle is so nice to hold! I have often gone to purchase an Aftelier perfume and decided against it for some reason. I don’t know why. I have no problem ordering the attars from Amouage but this line, the bottle, it just seems cheap. Maybe I’m a READ THE BOOK BY ITS COVER kind of perfumeistas that being said I would love a sample of about 4 of the Aftelier’s before I put down that much cash on something that looks like I gave my second grade teacher for Christmas back in the day, you know, from the pharmacy. Turns out she still wears that scent and I am 37. Just saying, are the Aftelier faithful passed the presentation? I’ve seen some of the Aftelier solids in gorgeous antique (real antique, not faux) compacts, pretty enough to be the envy of anyone who’d see you pull it from your purse. Still, these are certainly not inexpensive fragrances! It’s totally worth sampling them until you find one you love. I am a big fan of Mandy Aftel’s Cepes & Tuberose and Honeyblossom perfumes. For natural perfumes, they have amazing longevity and staying power. Although I’m not a fan of her fumes that have Jasmine Sambac notes, which has a scatol smell on me. Don’t think secret garden would be for me since there’s Jasmine Samba + Civet would be way too dirty. I think I’ll pass. I have heard nothing but accolades about Pandora. I’ve never tried DSH perfumes before. You can bet my first sample would definitely be Pandora. You’re welcome! Thanks, too, for your mini-reviews of the other Aftelier fragrances. It sounds like you’ve had lots of experience with natural fragrances–someday I’ll get there, too! You know, after the barnyard-y experience I had with Aftelier Sepia (which has jasmine sambac in the middle and more indole in the base), I would have expected that this one should have been that way on me as well, but it really isn’t, surprisingly. It is my recent experience that jasmines scream on me and emphasize the funk, but in this one something reins it in.. I don’t have the experience to know what, though. I actually get the other notes, starting with a sweet citrus at the beginning to the lovely floral middle with a spicy edge that I think may be from the jasmine, to a bit of funk toward the end with the civet. But it’s a relatively restrained funk and I don’t mind it. And it seems, actually, that in the drydown it kind of shifts back and forth between the civet coming out and then more of the vanilla-benzoin note, so it’s not all-funk-all-the-time at the end. Secret Garden is definitely more classical and romantic to me than Sepia. It’s fun to try them, though, and think about them side by side. Two fragrances I’d also like bottles of, too! I do have an ounce of Jub 25, but it hardly seems like enough. I like your description of that bottle! I have a small bottle of Pandora, and I love it! It smells very vintage to me, very classic chypre/oriental. I have experienced serious longevity problems with some natural perfumes (I have perfume-eating skin anyway), but Pandora seems to last better than many, perhaps 3 hours or so. Don’t you think it would be wonderful as a candle? I can just imagine my living room scented with Pandora. Angela, you make these both sound so lovely! I’m not as likely to test either of them, but they’ll probably go on the “someday it’d be nice” list! My gosh, my “someday” list is gigantic! I sympathize. I’m looking forward to trying these! I love DSH Mata Hari and Aftelier Tango. I go back and forth on natural perfumes. i spent the entire long weekend happily with Via del Profumo (Sharif, Grezzo and Tabac). Sometimes, only those genuine natural base notes (real ambergris, civet and hyraceum) will do. But then I do tire of keeping wrist to nose and crave sillage and high notes. I don’t really enjoy anything that seems thoroughly synthetic, though. Oh, also the evolution in time – sometimes I love that and sometimes I’m just wearied by it! Yes, I get that, too. Sometimes I just want to wear a perfume and enjoy it tangentially. Other times I’m ready to be sucked into it, spend time following its development. I know what you mean! I’m so used to the magic of synthetic ingredients. Yet I like the integrity of natural materials. Mata Hari is one I want very much to try but even the cost of a sample vial is prohibitive. Sadly these are ones that will have to wait for the “big lottery win” or an exceedingly generous bonus. I think the dock is crowded with those of us waiting for our ships to come in! I call them like I see them, Mandy. Secret Garden is a regular Liz Taylor of a fragrance. Hi, just wondering if Bois de Rose is rosewood, or something to do with actual rose? Mandy answered below that it’s rosewood. Great question! Is it real civet in the Aftetelier??? Still trying to decide if that would be a deal-breaker for me. I’m a meat-eater but avoid fur… and I don’t quite know where I’d stand on the civet thing. I understand why you hesitate. It seems to me that wearing Secret Garden wouldn’t cause any cats to suffer, since the civet is old (and already here), and I’d be willing to bet big money Aftelier wouldn’t chase down fresh civet just to keep the fragrance in production. When it’s done, it’s done. Still, if it grosses you out or disturbs you, I get that. Bois de rose is rosewood. The civet I use is old — I bought it from an old perfumers estate. Pandora smelled red to me not green, surprisingly and smelled a lot like my great grandmother- I haven’t figured out what she uses that smells like this.. I really want to know what your grandmother wears/wore! Is there a way you can find out? Sandalwood really is a gorgeous scent all on its own. Once a friend brought me real sandalwood incense from India. Wow, what a divine fragrance! I hated to burn it–but I wanted to smell it burning, too. I have a dram of Pandora, and I think it’s terrific. I wasn’t sure what to expect — the description of ruby fruits and ozone spooked me a bit — but the fragrance is beautifully composed. I think the ozone might contribute to a damp-earthy quality in the drydown, but the overall effect of this scent is far too complex for me to break down. Definitely agree that it seems to belong to a different era. And as much as I like my sillage monsters, I find that natural perfumes are a great choice when I’m going to the opera or the theater and want to wear something that’s interesting to me but not obnoxious to others. DSH’s Poivre has been a go-to for fall operas. That’s such a good point about public events. The last time I went to an opera (Don Giovanni, probably four years ago now) I wore Songes and flinched all night. I smelled gorgeous, but I was afraid the people around me wouldn’t be so generous! That’s a good point, Emily. I’ve gotten so paranoid about annoying my neighbors that I’ve stopped wearing perfume to events. That’s such a shame – perfume was meant for special occasions and adds another dimension of delight to dressing up and enjoyment of the event. I like your solution! It’s true, it is a good solution! Extrait in general tends to be less bossy than EdP or EdT, and a dab of extrait here and there might work, too.